Thomas Jefferson? W. W. Ziege? Elbert Hubbard? Orison Swett Marden? Anonymous? Nothing can stop a person with the right mental attitude from achieving his goal; nothing on earth can help a person with the wrong mental attitude. These words are often attributed to U.S. statesman Thomas Jefferson, but I have been unable to find a citation. Would you please explore this topic? Nothing can stop the man with the right mental attitude from achieving his goal; nothing on earth can help the man with the wrong mental attitude. — W. W. Ziege. No precise citation was given in “Forbes” magazine, and QI has not yet found a closely matching statement within the writings of Ziege, but he did craft a semantically similar remark in a 1945 piece published in “The Rosicrucian Digest”. Details are given further below. Ralph Waldo Emerson? Elbert Hubbard? Napoleon Bonaparte? Dale Carnegie? Anonymous? These words were attributed to the famous transcendentalist philosopher Ralph Waldo Emerson. I am skeptical of the ascription because I have not been able to find a citation. Would you please help? Quote Investigator: This saying has been ascribed to Emerson, Elbert Hubbard, Napoleon Bonaparte and others. QI has not yet located substantive evidence identifying the creator; he or she remains anonymous. 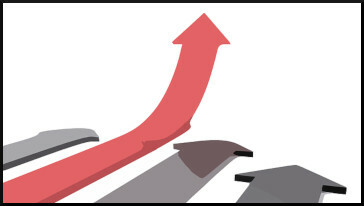 This article presents a snapshot of current research. “Fear defeats more men than any other one thing in the world,” says Elbert Hubbard. Elbert Hubbard founded a New York artisan community called Roycroft. He was known for creating, collecting, and popularizing adages. However, he died in 1915, and QI has not yet found any direct evidence during his lifetime that he authored this saying. Mark Twain? Elbert Hubbard? Anonymous? Never smoke more than one cigar at a time. Would you please determine when he enunciated these rules? I have achieved my seventy years in the usual way: by sticking strictly to a scheme of life which would kill anybody else. I will offer here, as a sound maxim, this: that we can’t reach old age by another man’s road. I will now teach, offering my way of life to whomsoever desires to commit suicide by the scheme which has enabled me to beat the doctor and the hangman for seventy years. I have made it a rule never to smoke more than one cigar at a time. I do not know just when I began to smoke, I only know that it was in my father’s lifetime, and that I was discreet. He passed from this life early in 1847, when I was a shade past eleven; ever since then I have smoked publicly. As an example to others, and not that I care for moderation myself, it has always been my rule never to smoke when asleep, and never to refrain when awake. Twain employed these two jokes and helped to popularize them, but instances occurred before 1905. EDITOR: A person employed on a newspaper, whose business it is to separate the wheat from the chaff, and to see that the chaff is printed. 3. A seraphic embryon; a smooth bore; a bit of sandpaper applied to all forms of originality by the publisher-proprietor; an emictory. Editor—One whose business it is to separate the wheat from the chaff and then print the chaff. Image Notes: Portrait of Elbert Hubbard from 1916 edition of “Little Journeys to the Homes of the Great” accessed via Project Gutenberg. Picture of edited text with red pen from 3844328 at Pixabay. Elbert Hubbard? Thomas Carlyle? Anonymous? Dear Quote Investigator: Working for a living consumes enormous amounts of time and energy. If you wish to be happy in life then it is essential to try and obtain happiness from your work. Would you please determine who created an adage expressing this idea? If you would be happy, do not look for happiness outside of your work. Get your happiness out of your work or you’ll never know what happiness is.—The Philistine. The reader must decide if this is a helpful insight or a misleading mantra for workaholics. Alfred Hitchcock? Elbert Hubbard? Theodore Parker? 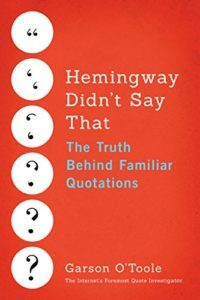 Dear Quote Investigator: The influential English film director Alfred Hitchcock employed the term MacGuffin when he discussed the plots of his movies. He also told a peculiar story to explain the meaning of the term. Would you please explore this topic? A.H. That secret clause was our “MacGuffin.” I must tell you what that means. F.T. Isn’t the MacGuffin the pretext for the plot? A.H. Well, it’s the device, the gimmick, if you will, or the papers the spies are after. So the “MacGuffin” is the term we use to cover all that sort of thing: to steal plans or documents, or discover a secret, it doesn’t matter what it is. And the logicians are wrong in trying to figure out the truth of a MacGuffin, since it’s beside the point. The only thing that really matters is that in the picture the plans, documents, or secrets must seem to be of vital importance to the characters. To me, the narrator, they’re of no importance whatever. “Well,” the other man says, “it’s an apparatus for trapping lions in the Scottish Highlands.” The first man says, “But there are no lions in the Scottish Highlands,” and the other one answers, “Well then, that’s no MacGuffin!” So you see that a MacGuffin is actually nothing at all. QI conjectures that the story above evolved from a humorous anecdote about an imaginary mongoose, and the term MacGuffin was derived from mongoose. Would you please explore its provenance? The Law of Consequences works both ways: by associating with the sinner and recognizing the good in him, you unconsciously recognize the good in yourself. The love you give away is the only love you keep—by benefiting another you benefit yourself. The above instance used the pronoun “you” instead of “we”. Hubbard constructed and disseminated a few variant statements. Mark Twain? Lilian Bell? Elbert Hubbard? Frank Ward O’Malley? Bruce Calvert? H. L. Mencken? Charles Dickens? Edna St. Vincent Millay? Anonymous? This situation is confusing. What do you think? “Bob has a motto on his wall which says ‘Life is just one damned thing after another! '” said Jimmie. But I refused to smile. I was too distinctly annoyed. The lead time for publishing a book has traditionally been lengthy; hence, Lilian Bell may have written her novel before 1909. Bell stated within the text that the adage was already being posted on walls. During the following weeks, months, and years the popular saying was widely disseminated. In December 1909 Elbert Hubbard printed the expression without attribution in a journal he was editing called “The Philistine”. In March 1910 a man named Bruce Calvert was credited with the saying. In 1919 the prominent cultural commentator H. L. Mencken ascribed the phrase to Mark Twain. After the death of Frank Ward O’Malley in 1932 some obituary notices credited him with the saying. In 1942 Mencken reconsidered his judgement and linked the saying to both O’Malley and Hubbard. Detailed information is given further below. Ralph Waldo Emerson? Elbert Hubbard? Sarah S. B. Yule? John R. Paxton? Orison Swett Marden? Anonymous? The origin of this saying was complex, and the topic has been contentious. Historically, the following people have been linked to the phrase: philosopher Ralph Waldo Emerson, aphorist Elbert Hubbard, clergyman John R. Paxton, and quotation collector Sarah S. B. Yule. Would you please examine this subject? If a man can write a better book, preach a better sermon or make a better mouse trap than his neighbors, though he builds his house in the woods, the world will make a beaten path to his door. Minor alterations in the text occurred as the quotation was widely replicated. The term mousetrap was sometimes presented as two words: “mouse trap” and sometimes hyphenated: “mouse-trap”. In modern times, the term often appears as a single unhyphenated word: “mousetrap”. The word “neighbors” was sometimes given in the singular form. The saying was employed as a filler item in newspapers, and it also appeared in columns containing miscellaneous short news items and sayings. The specific circumstances when Emerson spoke or wrote the statement were not specified. Over the decades the phrasing has evolved. For example, by 1901 a version with “build a better mouse-trap” instead of “make a better mouse-trap” was circulating. Common Fame. I trust a good deal to common fame, as we all must. If a man has good corn, or wood, or boards, or pigs, to sell, or can make better chairs or knives, crucibles or church organs, than anybody else, you will find a broad hard-beaten road to his house, though it be in the woods. Emerson was a popular speaker who delivered numerous public lectures over a period of decades. He used his journals as source material for his speeches, but the phrasing employed in the notebooks and speeches was variable. 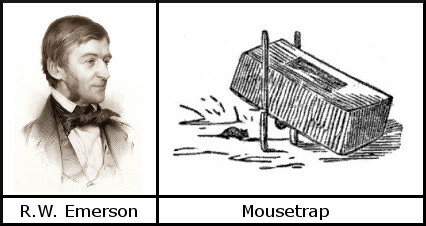 QI believes Emerson probably did voice the passage with “mouse trap” during a speech. Indeed, a woman named Sarah S. B. Yule stated that she heard one of Emerson’s public addresses and copied the “mouse trap” statement into a notebook. In 1889 she placed the remark into a published compilation of quotations and adages titled “Borrowings”. Detailed information is given further below.